Our range of products include multi color flexo printing & slotting machine, overhung eccentric slotter, rotary slotter combined, water based ink printing slotting and die cutting machine and automatic feeding partition slotting machine. Semi-automatic chain paper feed and side check plate positioning to ensure accurate paper feed. CAD modular design enables arbitrary combination of multiple-color printing units. Motorized shift and pneumatic locking up of printing units. The inker automatically breads away from surface to protect printing plate from damage in case of mechanical shutdown. Spontaneous-suction ink furnishing device, auto idling circulation of reticulated roll to prevent inky from being dried with auto cleaning. 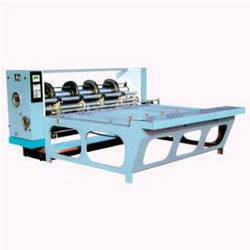 Plate hanging device are adopted for big drum printing. Plates to make a pasting easier and time saving. Options for reticulated roll consideration (165-250 lines/in.) international standard high procedure facing mechanism enables time saving in printing plate adjustment. Synchronous motor to shift of dividing, scoring, slitting and cutting with longitudinal harmonic adjustment. Special design and manufacture of slotting and corner-cutting knives enable long service life the high durability. This model is available in 3 and 4 colors and also with suction feeding. 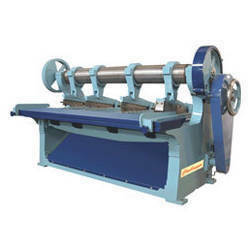 This machine is used for cutting, creasing, slotting and corner cutting of corrugated board simultaneously. 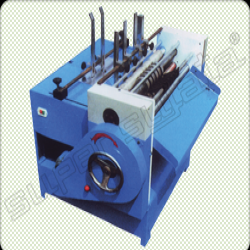 Four creasing, two side cutting, three slotting and one corner cutting heads are provided. The machine has a chain delivery arrangement. Slot depth is 12 inches. Maximum output is 60 sheets per minute. Synchronous adjustment of creasing dies with slotting dies. 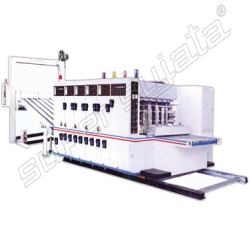 Looking for Slotting Machine ?